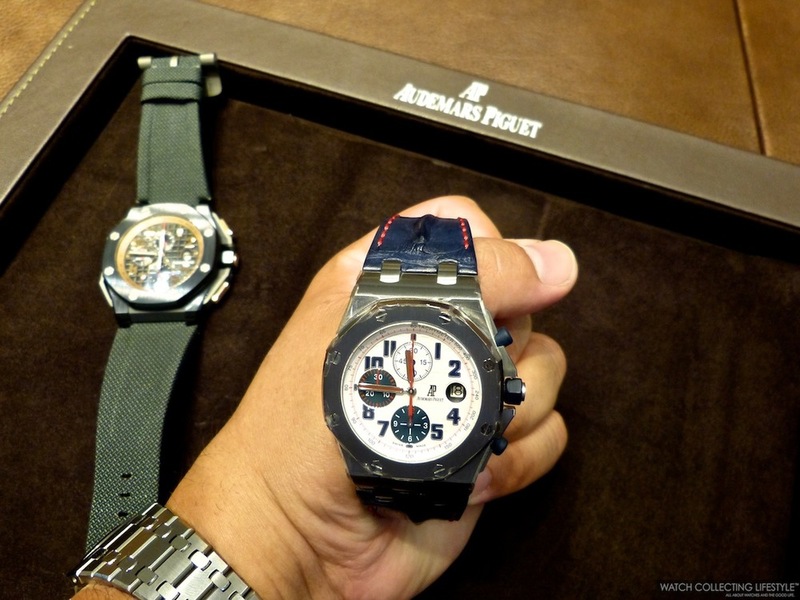 Rare Bird: Audemars Piguet Royal Oak Offshore Tour Auto 2012 Limited Edition. Only 150 Pieces Ever Made and One of Our Favorite Offshores. Last year while visiting New York City, we stopped by the Audemars Piguet boutique to shop around and work on one of our boutique reviews published here. After looking around for a while we spotted one of our favorite Royal Oak Offshores on display, we are talking about the ultra rare and hard to find Audemars Piguet Royal Oak Offshore Tour Auto 2012 Limited Edition ref. 26208ST.00.D305CR.01. This watch launched by Audemars Piguet in 2012 to celebrate the 21st edition of the Tour Auto Optic 2000 rally was launched in a limited series of only a 150 pieces with a very special presentation box that contains a watch display case shaped like a vintage automotive air filter. The Tour Optic Auto 2000 2012 race was held from April 16th thru the 21st and is Organized by Peter Auto for the Fédération Française du Sport Automobile —FFSA— with licenses from ASA Tour Auto. For an entry fee of €8,300 entrants get five days of competition driving all the way from Paris to a southern destination in France that is typically Nice or Biarritz. The rally race is open to 200 cars which —or the model of which— have participated between 1951 and 1973 in the Tour Optic Auto race. In 2013, the race —22nd Tour Auto Optic 2ooo— took place from April 22nd thru the 27th and for the first time, the finish line was in the southwestern French city of La Rochelle. Audemars Piguet has been the official timekeeper of the competition since 2006, reason why they decided to launch this special watch. Fitted with the traditional Royal Oak Offshore 42 mm case, this watch in stainless steel features a beautiful white Méga Tapisserie dial with contrasting colors inspired by the French flag with blue chrono counters at 6 and 9 o'clock, white running seconds register at 12 o'clock, blue Arabic numerals, white gold hands with red luminescent coating and a white tachymeter flange with red scale. If you like blue and red, this is perhaps the most appealing and beautiful dials on any Royal Oak Offshore launched to date. To round out the spectacular look of the watch, Audemars Piguet decided to carefully engrave the case back with the Tour Auto logo and pair the watch with a hornback alligator strap in blue with red contrasting stitching. 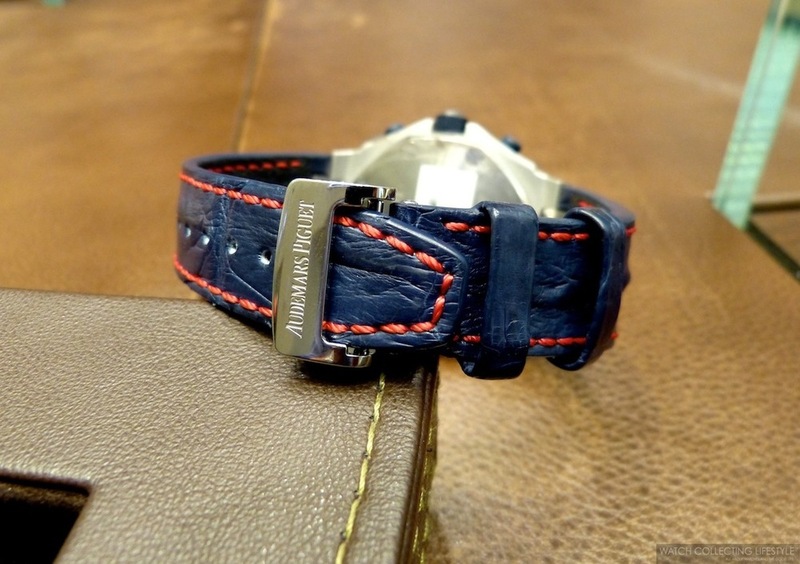 This watch just like most other Offshores is fitted with a deployant buckle. The Royal Oak Offshore Tour Auto 2012 is as rare as it gets and one Offshore that is extremely hard to find. On our way out we just couldn't get it out of our head. If you are ready to get a very special limited edition Royal Oak Offshore chronograph that is not the Rubens Barrichelo II reviewed here and that everyone wants, then this is the one. Now, if you can find a Royal Oak Offshore Gentleman Driver Limited Edition that would be a very close contender to this one, if not even superior. Sticker Price $34,200 USD. For more info on Audemars Piguet click here. Posted on January 8, 2014 by Editor & Publisher and filed under Audemars Piguet and tagged Tour Optic Auto 2000 Audemars Piguet Royal Oak Offshore ref. 26208ST.00.D305CR.01 Audemars Piguet Tour Auto 2008 Audemars Piguet Tour Auto 2012 Audemars Piguet ref. 26184ST.00.D003CU.01.